Astrée is a sound static analyzer of C source code. Its primary purpose is proving the absence of runtime errors. This in­cludes viola­tions of the C99 standard and implementation-specific undefined be­haviors. 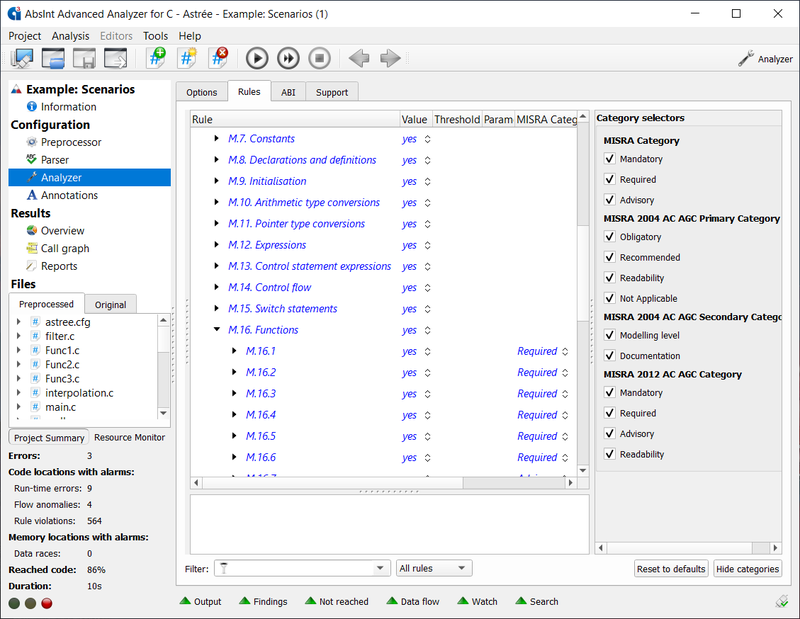 However, Astrée’s sophisticated analysis engine can also be applied to address other program properties relevant to functional safety and security, and to check for viola­tions of user-specified programming guide­lines. This page offers a quick overview of how Astrée supports and checks for the C99 standard, the Common Weak­ness Enumer­ation (CWE) catalog, the SEI CERT C Coding Standard, the ISO/IEC guide­lines, and the MISRA C rules. Annex J of ISO/IEC 9899:1999 (E) covers behaviors the standard regards as unspecified, undefined or implementation-defined, listing in three sections hundreds of scenarios in total. A 34-page PDF description of how Astrée addresses each of these scenarios is available. For each section of Annex J, the document lists all the covered situations and provides details about how each is handled by Astrée. If you have Astrée installed, you can access the document via “Help” → “C compliance matrices”. Otherwise, contact info@absint.com to request a free copy. Below is the list of supported CWE rules as of Astrée 18.04. This includes items with the CWE CCR accuracies Exact, CWE-more-abstract, and CWE-more-specific. Items with the accuracy CWE-partial are grayed out. For further details, see Astrée’s “Help” menu or contact info@absint.com. Astrée is sound, in that if a message or alarm is relevant for a given program, it will be reported by the tool. Below is the list of SEI CERT rules and recommendations supported as of Astrée 18.04. The grayed-out items are supported partially. Exclamation marks denote recommendations that, by definition, cannot be checked for automatically by any tool. Further details are available via Astrée’s “Help” menu or by contacting info@absint.com. Astrée’s integrated RuleChecker supports both MISRA-C:2004 and MISRA-C:2012 (including Amendment 1). It is highly configurable, allowing you to check for individual rules and even specific aspects of certain rules. To save time, the RuleChecker can also be invoked separately, without running a full-fledged Astrée analysis. However, semantical rules greatly benefit from running Astrée, as the soundness of its semantic analyses guarantees zero false negatives and minimizes false positives. This is where Astrée truly shines, as no competing MISRA checker currently on the market is capable of checking for these rules with such precision, and no testing environment can guarantee the full data and path coverage required. As of Astrée 18.04, a total of 277 rules of the two rule sets are checked. An 11-page PDF description of how Astrée handles each rule is available on request. Contact info@absint.com for your free copy. Below is just a quick overview of all the supported rule categories. Checking C++ code is possible starting with the most recent release 18.04. A majority of MISRA C++:2008 rules are supported. Below is the list of ISO/IEC TS 17961:2013 rules supported as of Astrée 18.04. The grayed-out rules are supported partially. Further details are available via Astrée’s “Help” menu or by contacting info@absint.com.